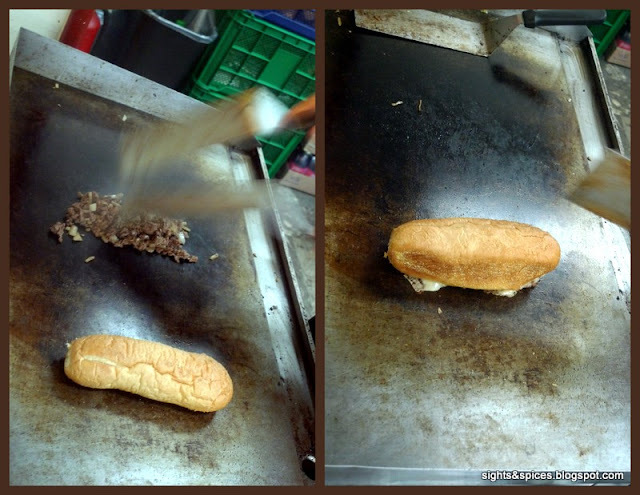 We just had our food crawl in Little Tokyo when we saw a brightly lighted store called The Cheese Steak Shop. Out of curiosity we went inside and I decided to try out the original Philadelphia Style Sandwich. I found out that the store is originally from San Francisco and has branches all across the U.S. I've tried Philly style sandwiches from different restaurants before but there isn't one that was memorable. The store boast of using Amoroso's Heart-Baked Soft Rolls which are all imported from the U.S. I ordered the 7" Classic Philly Cheese Steak. Thin strips of lean beef were grilled then sliced into smaller pieces, two slices of cheese were placed on top and as soon the cheese melts, the Amoroso bread roll which was being grilled on the side was used to sandwich and scoop everything up from the grill. As a finishing touch, chopped grilled onions and sweet hot peppers were placed on top. I brought the sandwich home and heated it up in the toaster. The sandwich tasted pretty good. The steak was seasoned well, it just had the right amount of salt and pepper, the strips were also so tender and it didn't take much effort to chew on it. The bread roll was soft and it had a chewy texture. I would have wanted more cheese on the sandwich because I barely tasted it. What I really loved about the sandwich is the grilled onions and sweet hot peppers on top, it instilled the much needed layer of flavor. If there is something that can be a turn off, it would be the price. Its a bit too pricey for me but then again maybe it's just because I'm not used to shelling out that much for a sandwich. The quality of the ingredients were excellent and I really enjoyed every bite out of it. it's OK, nothing specia IMO. tried it once.